RRB has released 26502 ALP and Technician vacancies in its latest job notification. Candidates who are in search of RRB ALP previous year question papers and model papers can download and practice from here. RRB ALP previous year paper play an important role in the exam preparation. Let us have an overview of RRB ALP and Technician Job latest notice. 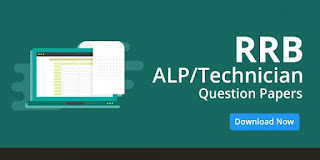 RRB ALP Previous Year Solved Question Paper will act as model papers or sample papers which will help you to understand the syllabus, pattern and weight age of questions asked and difficulty levels over a period of time RRB ALP Technician Previous Year Question Papers and solved RRB ALP model papers are available for free download. Solving previous papers for RRB Assistant Loco Pilot exam is a crucial part in the exam preparation and plays a deciding role in your success. If you solve them on regular basis, you can appear for the actual exam in a confident way.